Waterboss is a whole house water softener that treats your entire homes water supply, so that you get great tasting water that is free from minerals, sparkling glasses and dishes and even whiter clothes. 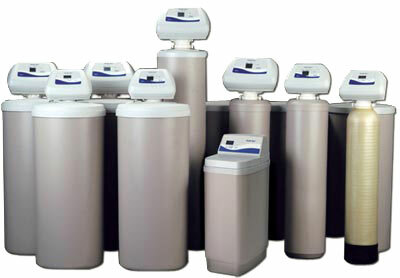 Waterboss is a leader in the water softening industry and produce some of the best water softeners on the market. Each waterboss unit is easily controlled using the intuitive control panel located on the top of the unit, which controls the entire water treatment process. As water comes into the unit, it first passes through a dirt and sediment filter, which filters out any sediment that enters through your well or breaks away from your pipe. Next in the 700 and 900 models, iron is removed through the next step of the filtration process, which removes up to 10 parts per million of ferrous iron from your water supply. If you compare the iron filtration of the waterboss’s competitors which only remove 5 parts per million (5ppm) it is easy to see why homeowners prefer the waterboss to other water softener systems. Finally if you have the Model 950, it removes chlorine from your water supply, using a combination of Redox Media, Actvated Carbon and super fine mesh resin. Waterboss has four different types of their whole house water treatment systems, that are designed for different amounts of usage and have slightly more advanced filtration capabilities as you go up in price. The waterboss systems include the 350, 700, 900 and 950 which you will find listed below and additional information on each system. The Waterboss 365 is a whole house water softener designed for large families. This model can soften up to 90 grains per gallon and remove ferrous iron and dirt and sediment down to just 20 nominal microns. The unit is compact and can fit in tight spaces, measuring just 14 inches wide by 30 inches tall. The unit can hold up to 36,400 grains and offers a fast regeneration process. It also features a built-in self cleaning whole house filter, meaning that you never have to worry about changing or buying expensive cartridges, just to operate the unit. The water softener takes just 38 minutes to complete the full regeneration process and uses just 27 gallons of water to fully complete it. The WaterBoss 700 is designed for medium sized single family homes, it is designed to use less water than other comparable units from other manufactures. It can also be used as an iron water filter, reducing iron up to 10 parts per million. Like the other waterboss units, it uses a self cleaning filter, meaning that you never have to worry about replacing the filter or the added costs that comes with replacement filters. The regeneration process takes just 16 gallons of water, and is completed in 18 minutes using just 2.5 pounds of salt. This unit is great for most families who do not have problems with chlorine in their water supply and want a simple to use whole house water filtration system with minimal maintenance. The WaterBoss 900 is a great whole house water filter designed for large family homes. The unit is compact and offers a self cleaning filter, which means that you don’t have to worry about constantly ordering replacement cartridges or trips to the hardware store. The unit has a generous 36,400 grains capacity, and can tackle even the toughest hard water. The unit also doubles as an iron water filter, reducing any trace amounts of iron down to 10 ppm. The unit is manufactures in the USA, and can be easily installed by most homeowners if you have an electrical outlet nearby and basic plumbing skills. The hardest part would be sweating pipe, for homeowners with copper plumbing. However, these days there are a number of copper compression fittings available at your local hardware store, so even if you have never worked with copper piping you can still install this unit. The unit takes just 38 minutes to complete the full regeneration process, and uses just 27 gallons of water and only 6 pounds of salt, making it a very efficient running unit. The WaterBoss 950 water softener is a high capacity whole house unit, that is designed for homeowners living in a large city. The unit can soften up to 35 grains per gallon and has a capacity of 22,000 grains. The unit is different than the other two units, being that it also can filter and reduce chlorine from your water supply, using the built-in chlorine filtration system. Keep in mind that it does filter less water than the WaterBoss 900 or 365 so it is not ideal for large family homes. Like all WaterBoss models, it contains a self cleaning filter, that removes sediment, iron and other minerals while at the same time softening your water. The regeneration process is also very quick, taking just 19 minutes and using only 2.5 pounds of salt. The small factor, makes it ideal for city dwellers and condo owners who want a single water softener and water filtration system for their entire home or condo. Some final words on the WaterBoss whole house filtration systems, the units are manufactured in the US and are efficient easy to install units that should only take a few hours to set-up for most homeowners as long as they are replacing a water softener. If you are installing a water softener for the first time, you will want to make sure you have an electrical connection to plug-in the unit, you should also be aware of the latest building and plumbing codes, to make sure the unit is installed properly. If you do require a plumber, you can find a local licensed plumber to install the WaterBoss unit for a few hundred dollars, depending on the plumbing and electrical work that needs to be done. Overall if you are looking for a compact unit, that requires little maintenance other than replacing the salt, then the WaterBoss is a great whole house water softening system.